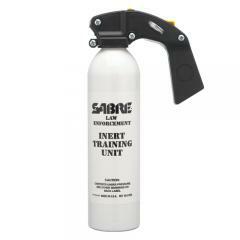 Sabre 16.0 ounce H2O Inert Training Units are the perfect way to train for effective use of the company's popular self defense sprays. The contained formula is patterned after their water-based H2O sprays but contains no capsaicinoids, the irritating chemicals that give pepper spray its effectiveness. This allows trainees to practice aiming and firing without having to worry about poor aim or blowback. It features a pistol grip for accurate aim, as well as a safety pin that prevents accidental discharge. Stream, foam and cone delivery systems are available, allowing officers to practice with the same technology that they will use in the field.